There’s a lot of physics in this glass cup of coffee, enjoyed at Coleman Coffee, Lower Marsh. Coleman Coffee on Lower Marsh, Waterloo, is a surprisingly relaxing place. Surprising because the frontage gives little away. A door with windows on either side revealing a small wooden bench on the right and a larger table on the left. A food menu is on the left, the coffee menu in front of you (above the counter) and a note about how the coffee is roasted on a black board on your right. The space feels open and welcoming but it is the garden at the back that I think shifts Coleman Coffee from being a lovely little café to a great spot at which to just spend time and notice things. My first visit was on an incredibly hot day in early July. 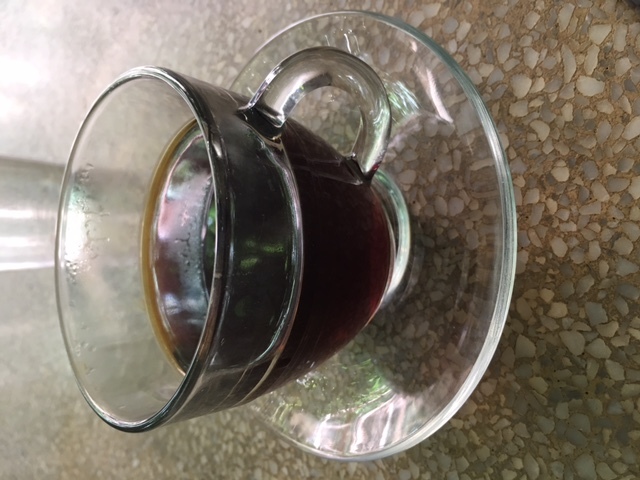 For some reason I didn’t see the filter coffee option on the menu and so chose a long black to enjoy outside. The shade of the trees was a welcome respite to the hot Sun and the contrast created by the light provided much to dwell on with the inadequacies of my phone’s camera. Berries had formed on the tree growing up the wall of the café. After my visit I read the review of the café on Brian’s Coffee Spot and realised that these berries were mulberries. The other trees providing the shade were a Jasmine and a Pomegranate. I also found that I had missed the filter option and so a return visit was obligatory! How easy it is not to notice things. Chocolate milk and a paper straw. A second visit sadly revealed the restricted opening hours of Coleman Coffee. Arriving at about 2.58pm, we were told it was take-away only as they were closing at 3pm. However the third visit was worth the wait. By this time the weather had turned and it had been raining, but the garden was still calling. The filter coffee on offer (V60) was either a Brazilian or a Guatemalan. Opting for the nuttier of the two (an allergy to actual tree nuts does not prevent my enjoying nuttiness in coffee! ), we took a couple of glasses of water through to the back and awaited our drinks. When they arrived, it was interesting to find that the nutty coffee was truly nutty. A lovely flavour and mouthfeel to enjoy. 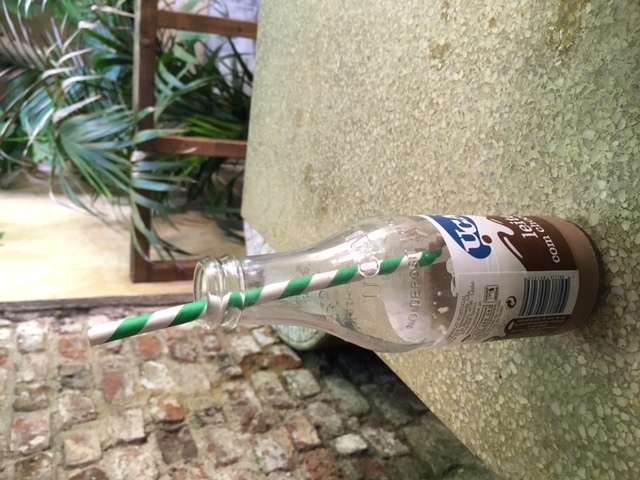 It was also great to notice that the straw in the chocolate milk seemed to be an old-fashioned paper straw (rather than the environmentally problematic plastic straws). As it had rained, the stools outside were a little wet, even though they had been largely sheltered by the same trees above the garden. This time, the mulberry tree seemed mulberry-less, apart from the one berry lying sorrowfully on the floor. The red of the berry being squished (accidentally) underfoot leaving it lying and injured in the style of Pyramus and Thisbe. Across the other (wetter) side of the garden, three spiders were busy weaving new webs, ready to catch whatever flies came their way. It would have been easy to watch those spiders for hours but I think a good café can linger in the memory long after your visit has ended and so the spiders are still spinning their webs in my mind now. 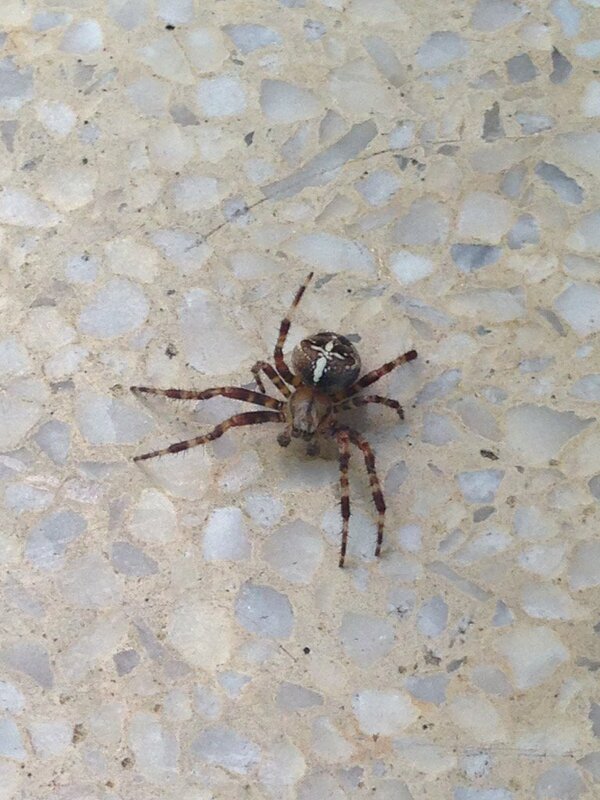 Spider on the table. 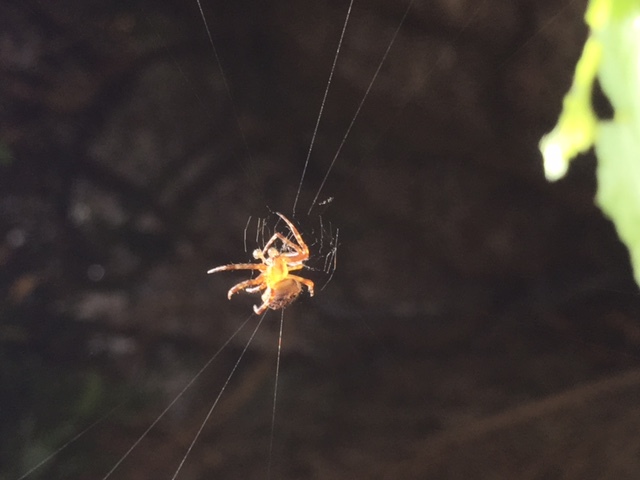 What could be better than time spent contemplating their webs? Photos of spiders webs glittering with dew drops are common place but somehow strangely attractive. Beads of dew gather at various points on the web leading to descriptions of cobwebs as being laden with jewels. A few years ago, a scientist contemplating spider’s webs asked why it was that water collected like jewels on the webs? Why didn’t it collect similarly on your hair? (You can read more about his story here). The team looked at the webs of one particular spider with an electron microscope. Electron microscopes can magnify things far more than optical microscopes (for images of coffee under an electron microscope click here) and so the scientists were able to observe how the hydrophilic (wet-able) fibres in the web turned from ‘puffs’ to ‘knots’ as they got wet. Water falling on the web was then attracted to these knots, partly due to an effect caused by the knot shape and partly due to the surface tension gradient of the water along the fibres. The results of the study can be found here. Although it took five years of investigation after the initial contemplation, this study of spider’s webs could lead to tools that could be used for water collection or in devices to aid chemical reactions. Which brings us to the other ‘C’ of the title: crows. Sadly there were no crows in the garden on either of my visits to Coleman Coffee. Nonetheless there is a link. My first visit had been cut a little short as I was headed to the Royal Society Summer Science Exhibition. Apart from the fact that it was baking hot inside the Royal Society, this science outreach event had a good mix of science/experiments for adults and for kids, it was great to wander around and learn a large number of new things. So many exhibits caught my eye but the one that connects with Coleman’s and cobwebs was the exhibit on tool making crows. Crows have been shown to be great tool users. Particularly the New Caledonian Crow which has been shown to even make hooks out of twigs in order to fish out insects from their hiding places. While thinking about what it was that led to this species of crow becoming adept at tool use (and therefore perhaps an explanation of human tool use), it became apparent that the two particularly good tool using crow species lived on remote islands without predators. Not only did they have the physical ability to create tools (a straight beak for crows, a thumb for humans), they lived in a place where they could have time to explore and to create, to develop tools to enable them to get the most tasty bug. Just as the scientists had needed time to watch, to investigate and to think about spiders webs in order to create new tools, so crows may have needed that time to explore their tool use. Perhaps it’s worth pushing the analogy to inner-city London (or indeed wherever you are). The more we spend time out, contemplating and enjoying nature, the more productive we can be. But to develop, we need to slow down, to think, to contemplate, and to enjoy great coffee in surroundings as special as at Coleman Coffee.